Mukesh Sharma: The growing demand for pork resulting from the growth of the hotel industry and the proliferation of fast food chains in the country has prompted farmers to go in for pig farming in a big way. Ruben Sada , a farmer who has a started piggery farming in half acre near relly , a tourism spot about 10 kms from Kalimpong town took pig farming a few years ago. He started with 12 animals and now has 3000 plus pigs in his farm. The high breed pigs were bought from Nepal Pokhara few years ago. "I can rear up to many pigs in one acre, because swine breeding can be done in a compact shed. Compared to dairy farming, pig farming is quite cost-effective. A dairy farmer can rear only five head of cattle in one acre of land, as he has to grow fodder for the animals too. Land is very expensive and rents are exorbitant. Buying fodder makes the venture unviable. Pig farming is a lucrative proposition for small and marginal farmers," Sada said. Sada run a advanced farm using modern technique.The piggery farming have create a profitable business and have create new employment possibilities here.According to him, there is tremendous potential for pig farmers, because the demand is huge. "We get visitor from Siliguri, Bhutan, Duars , Sikkim who want piglets and some come for practical knowledge . Sada who have planned to bring pig meat in Kalimpong town next month onwards. He said nowadays people are very conscious about their health we will provide them nutritious meats which is good for health. 8-10 month old pigs will be used for meat. Planning of implementation of meat supply in broader scale he said that the farm of his have given employment to 8-10 youth who are engaged in the Farm. Piglet, pregnant swine adult swine are kept in different modern advanced sty. Starting the business with 1.12 lakhs now the graph have climb about 50 lakhs. Sada hard work has gone recognition from State government as he was awarded with Mati Award 2016 in agricultural sector in the beginning of the year. 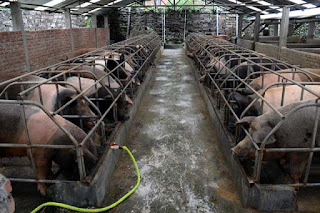 Pig farming in kalimpong brings Mati Award 2016 - Ruben Sada , a farmer who has a started piggery farming in half acre near relly , a tourism spot about 10 kms from Kalimpong town took pig farming a few years ago.